I have written about the Jungle Bird cocktail in two detailed article the past two years [Part One here Part two here]. This is part 3 as a new development has sufficed. We know now who the real creator of the Jungle Bird cocktail is. In Part 1, I was speculating about who would have the knowledge of creating a cocktail that would make such a strong impression to anyone who has tasted it. That the reputation of the drink has travelled all the way to the American where it was written about in 1989 in a bartenders’ guide. Someone who’s worked in the old KL Hilton, where the cocktail was served as a welcome drink, told me that it was the then F&B Director. I believed him, the director was German and he could have been knowledgeable about classic cocktails. Mind you, tiki cocktails (which the Jungle Bird is considered as one) died in the 50s and Jungle Bird was created in 1973. So the for him to introduce a tiki cocktail as a welcome drink for the hotel guests based on the tropical weather totally make sense. The story was also published in the first issue of our print magazine in March 2017. The story then developed, I spoke to more people and got closer to knowing the bar crew at the opening team of the hotel. There were six outlets in the hotel, out of which the lobby bar that guests would first encounter the welcome drink was the Aviary Bar. The bar was named after the birds which were kept free roaming in a netted area right outside the bar, where chirps from the colourful bird would be heard in the bar. Then I met David Hong, who was in the wine section of the hotel during the opening team (he import and sells wine now). He totally collapsed my theory about the German F&B Director being the creator of the cocktail because the Director had no clue about cocktails, he’s a chef! He said that the hotel wanted a tropical drink as the welcome drink and the barmen (that’s what they’re called at that time) were tasked to create one with tropical fruit juice, served in porcelain and garnish with an orchid. The Beverage Manager at the time was Jeffrey Ong, his creation was picked out of six drinks made based on creative creation (as in freehand, or now referred to as twist) from the classics. Most of the barmen at that time already had basic knowledge of classic cocktails from their time in previous hotels such as Merlin Hotel or Federal Hotel. The Jungle Bird cocktail was named that way to commemorate the bird of the Aviary Bar. It was said to have been served in a brown and greenish bird shape porcelain glassware. These glassware were used up to the end of the hotel before it was closed in 2013 when it was run as Crowne Plaza Mutiara. Unfortunately, the glassware were stolen before they’re sent to auction. We can’t find a picture of the original drink to date. If you have any information, please send us an email at editor@thirstmag.com. Let’s talk about Jeffrey Ong - He was born in Penang and now 72 years old. Yes, he is still alive and we get to tell his family about his story when we found him earlier this year. Here is a picture of Jeffrey Ong when he was very, very young! 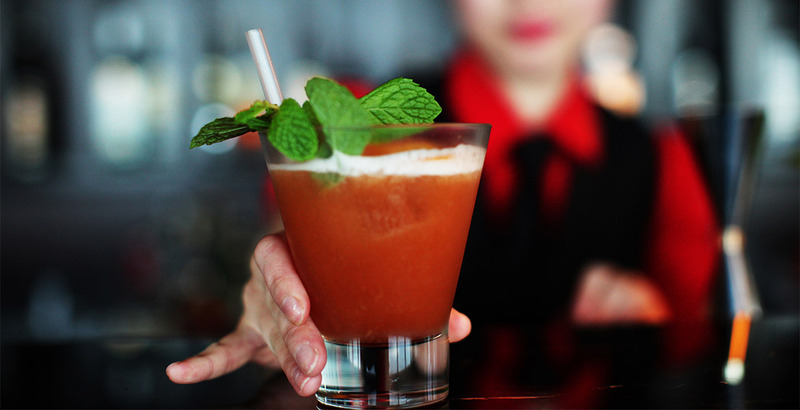 Jeffrey left to move back to Penang after a two-year gig with KL Hilton and started working for Rasa Sayang Resort in Penang, where he created a welcome drink that’s also very popular to any guests who have stayed there. The drink is called Asmara with pineapple juice, mango juice, grenadine, lime juice, simple syrup and a dash of bitters. The Assistant Beverage Supervisor at the time, Andrew Charles, describes him as “Nice guy to work with, who parts his knowledge to the staff and cared for their welfare.” We also found out that Jeffrey was very quiet, soft-spoken and doesn’t drink! His wife once asked him, how did he make all those cocktails when he doesn’t drink? He said he used his nose and taste the drink but not fully consumed them. Jeffrey left the bar scene in 1979 where he went to work as a clerk for the purchasing department of a hotel. You’d think it’s such a waste that a talent like him didn’t continue to make more wonderful drinks. He didn’t think like that, he just didn’t want his wife to worry about him working late and he wanted to build a family. Jeffrey worked in purchasing department of Cititel towards the end of his career when he retired. We ask for the public to respect the privacy of the man and his family and understand that they are not people who want the publicity. We ask you to remember Jeffrey Ong, the Penangite, as the picture above shown, and a man who cared for everyone around him, as well as a professional who is very much respected in his field. All we need to know now, is as a Malaysian, Jungle Bird cocktail will always live inside us. Whichever good cocktail bar you visit anywhere around the world, order a Jungle Bird and the bartender will make you one. Because, it is that famous.